When we bought our house in Florida, there was no AC. It was probably the reason why the buyer before us backed out. We love the property and the location. Who doesn't want to live near NASA's Kennedy Space Center and the beach anyway? To make the story short, we bought it and flipped the house. We put in new AC unit and ductwork. The house was really great and it was a good buy for us. Anyway, if you find a property with AC problem, do not be afraid. Put in new AC or hire Durham air conditioning repair. It is totally worth the money to spend. My father and brother know how to play a keyboard such as akai midi to cv. Not me though. The only musical instrument that I know is the guitar. When I was in college, my father tried to sell his precious keyboard and because I do not want it gone from his possession, I bought it and keep it. I thought when the time comes; I will give it back to him as a gift. This post brought to you by Bahama Breeze. All opinions are 100% mine. Oh Summer time is always a fun time for me! We live just two streets away from the beach so; just imagine the exciting activities of summer that we have here. The famiy get-togeher, jetski rides, boating, crabbing, and swimming are just few of the many things we love to do. My family loves great food, good music and cocktail drinks that taste heaven! Don't you love that idea? Let me tell you, if you do not live near the beach but you want to experience the coolest summer time event then, visit Bahama Breeze in your area. You will definitely enjoy great music, dilicious food and amazing drinks! The Bahama Breeze Summer Beach Bash is on going right now and this makes summer time even more exciting. This fun even started last June 23rd and will last up to August 3rd so; attend the event with your family and frends to celebrate summer fun. 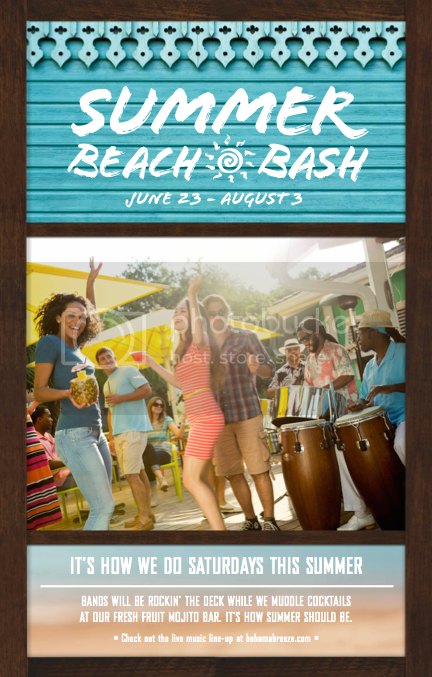 The Summer Beach Bash is all about live music that they bring out to the patio and the unveiling of the new signature drinks, the Ultimate Pineapple. You must have tried the Ultimate Pina Colada so; I am sure that the taste of the new Ultimate Pineapple will amazed you. Afterall, this frozen drink is a must have cocktail this summer. The #UltimatePineaple is served in a fresh cut pineapple so; this frozen drink will defnitely blow your mind especially if pinepple fruit is your favorite. You should know that Bahama Breeze is the summer destination for good times where you got to enjoy live music, good food and amazing cocktails with your family and friends. Visit Bahama Breeze in your area and celebrate the good times! When you are enjoying your Bahama Breeze Ultimate Pineapple drinks at Summer Beach Bash event, you can also participate in the Instagram Selfie Contest and you will get the chance to win a $25 gift card at Bahama Breeze. Just share an awesome selfie of you and your friends while having a good time at the Summer Beach Bash. Do not forget to use the hashtag #MBBSelfie and your selfie entry will be entered in the contest! Fun and easy right? Find the Bahama Breeze in your area from now up to August 3rd and atend the exciting Summer Beach Bash! Have fun!